Members of the 100 Island Challenge team (Nicole Pedersen, Chris Sullivan, Stuart Sandin, and Brian Zgliczynski) returned from an expedition this past August to survey coral reefs at a subset of atolls in the Tuamotu Archipelago, French Polynesia, as well as re-visit several islands in the Southern Line Islands, Republic of Kiribati. 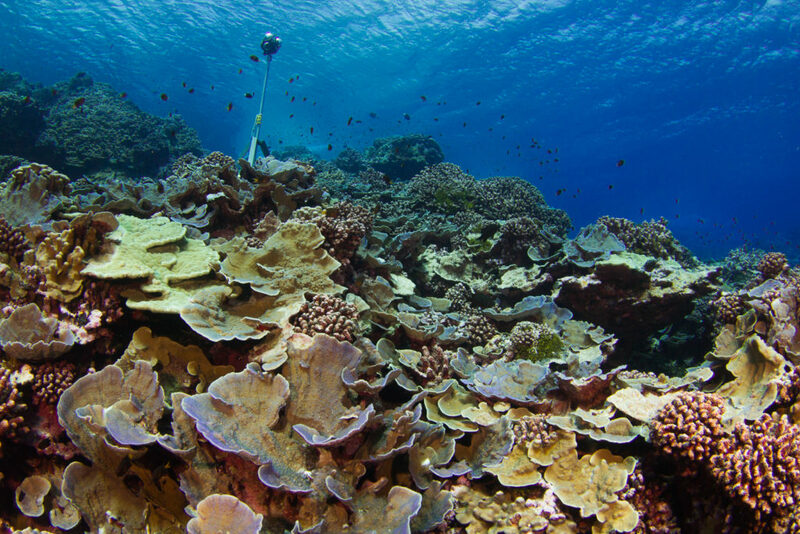 This expedition was supported by the Waitt Institute and represented a collaborative effort between the Scripps Institution of Oceanography, Waitt Institute, Centre de Recherches Insulaires et Observatoire de l’Environnement (CRIOBE – French Polynesia), Korero O Te ‘Orau – Cook Islands, and The Nature Conservancy – Hawaii. The goal of the 14-day expedition was to characterize coral reef communities as part of the 100 Island Challenge. The coral reefs of the Tuamotu Archipelago and Southern Line Islands are remote and relatively free of direct human influence. Therefore, they provide researchers with an opportunity to study intact ecosystems with thriving coral and fish communities. Although this was the first opportunity to visit sites in the Tuamotu islands as part of the 100 Island Challenge, our team has conducted multiple survey efforts to the Southern Line Islands over the past several years. 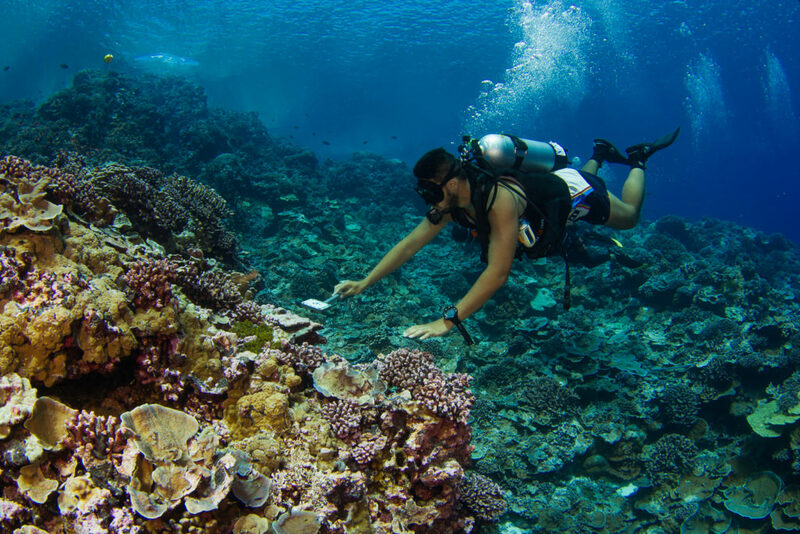 This expedition was particularly important because it provided our team with an opportunity to investigate the status of coral reefs of the region in conjunction with reports of widespread coral bleaching across the Pacific. By establishing new survey sites and re-visiting long-term sites are team will contextualize changes in coral reef communities through time and gain invaluable information on how these diverse ecosystems respond to recent warm water events. The team was excited to visit these sites but there was some apprehension over what they would find. Would the coral reefs of these islands be another casualty of the global mass-bleaching event? Upon entering the water the team was filled with mixed emotions. Preliminary observations reveled that the reefs had been impacted by the warm water events. However, the magnitude appeared to be species-specific and variable across islands. For example, fast growing species appeared to be hit the hardest while slower-growing species appeared to be impacted to a lesser extent. While the observed mortality was discouraging, the team was excited to see evidence of recovery and regrowth. Corals that had recently died were being overgrown with coralline algae, an important reef builder that strengthens the reef and provides substrate for new corals to settle and attach. 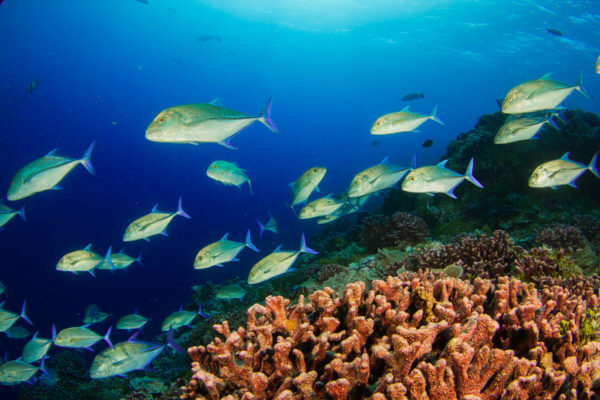 Additionally, the team observed healthy populations of reef fishes including predatory species like jacks, snappers, and sharks as well as abundant populations of smaller-bodied species that are important food sources for predators. Overall, the expedition represented a successful collaborative effort and the team gained valuable insight into the structure and function of coral reefs in the two regions. 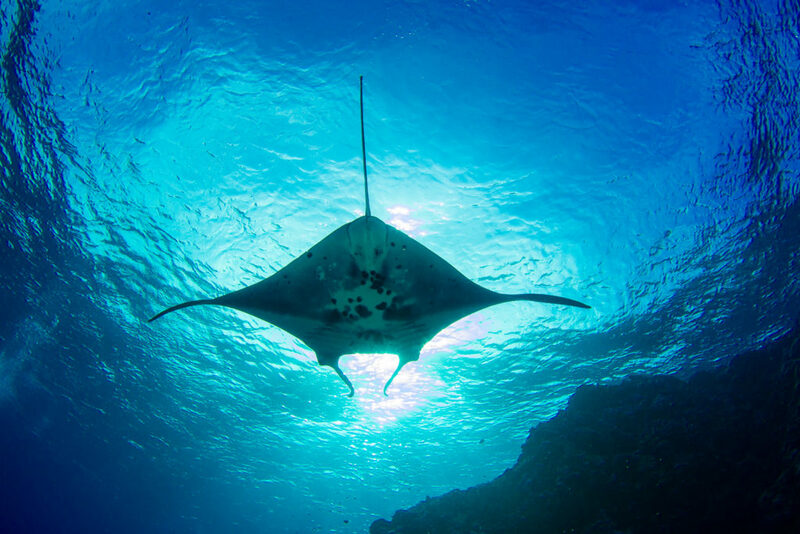 During the course of the 14-day expedition, the team conducted over 300 scientific dives across 6 islands (Millennium, Flint, Vostok, Takapoto, Tikehau, Rangiroa). These dives were comprised of 47 total photomosaic benthic surveys (14 resurveys of permanent sites) and 59 reef fish surveys. This high level of productivity could not have been possible without the hard work and efficiency of the crew of the M/Y Plan B. Researcher James Kora (Korero O Te ‘Orau – Cook Islands) setting up the large area image plot area by laying out calibration bars used to scale the mosaic models. The 100 Island Challenge team collected 360 video footage throughout the expedition to share the underwater journey with the public. These videos will be shared and on display on our website and at the Birch Aquarium at UCSD. Manta ray as is passes over the scientific dive team.